What is oil pulling good for? Oil pulling is an old folk tradition from India that has gained considerable popularity in Western civilizations. The method has been mentioned in the Ayurvedic text Charaka Samhita, where it is called Gandoosha or Kavala Kavala Graha. How does oil pulling detoxify? In Ayurvedic text, it is indicated as beneficial for oral health and a cure for chronic diseases such as diabetes and asthma. The explanation is that oil pulling pulls toxins from the body. Another theory is that the oil is able to remove harmful bacteria, and toxins between the teeth, before they spread through the body. The rinsing with oil activates enzymes in our saliva which pick up bacteria and toxic substances. The oil then acts like a magnet and attracts bacteria and toxins. As a result, they do not get a chance to cause diseases and illnesses. The skin in our mouth is very porous and in close contact with our blood flow. This is the reason why so many toxins can be pulled out through the mouth. According to Ayurveda different parts of the tongue are in contact with specific organs, such as the kidneys, liver, heart, lungs, pancreas, intestines, stomach and spine. According to this theory oil pulling kills bacteria in the mouth, so they can not spread in the rest of the body. Most oils have anti-bacterial properties. In addition, some oils, such as sesame oil, also have anti-inflammatory properties. For this reason, it is important that oil pulling is practiced for 20 minutes. This allows the oil to reach holes and corners in your gums, where harmful bacteria reside. According to the first theory, toxins and bacteria are pulled out of the body via the mouth. According to the second theory, toxins and bacteria are removed from the mouth before they arrive in the body. It has not been proven which theory is correct and whether oil pulling actually works. However, there are many positive experiences known, and oil pulling is so simple and affordable that it definitely is worth to try it yourself. Oil Pulling is the best way to whiten your teeth at home, as It is very effective in removing stains from your teeth and lighten up any yellow discoloring. You can rinse with olive oil, sesame oil, sunflower oil, linseed oil, hemp oil, or coconut oil. Always use organic cold pressed and unrefined oils. Swap the different oils, so that you use all the features of the different oils. If you don’t like the taste, add some peppermint extract. Take the oil in your mouth, and swish it gently around for twenty minutes. Make sure you move it well between your teeth and through your whole mouth. In the beginning you might only be able to do it for a minute. If so, then build up slowly to twenty minutes. You can do this while you are showering or during a household chore. Don’t swallow the oil not, it is full of toxins. Rinsing with oil is one of the safest home remedies for teeth whitening, and you can do it every day for an extra detoxifying effect. If you only want to whiten your teeth, two times a week will suffice. 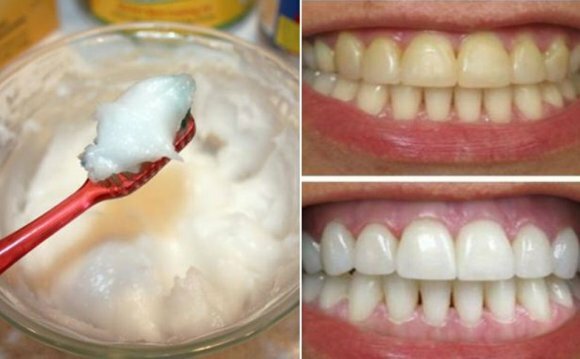 So now you know how to bleach your teeth at home, without breaking the bank or damaging your teeth! I hope you work it into your morning routine, and get that great smile you always wanted! Fast White Teeth Dot Com aims to provide the best, most accurate information for your teeth whitening needs. If you are looking for DIY teeth whitening method or having question about ingredients in whitening toothpaste (i.e. what is baking soda toothpaste? ), we are here to answer your questions. If you are just wondering what your options are and how much teeth whitening treatment will cost you, or simply looking to find the best toothpaste reviews that will help you spend your money wisely, make sure you check out our in-depth guide and reviews. Finally, leave a note and let us know what you think!